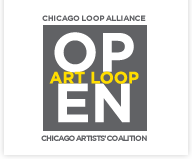 Celebrate the inaugural city-wide Art Loop Open now through October 29 at Chicago French Market! Located at 131 N. Clinton St., the market serves as a hub for the West Loop/Fulton River District neighborhoods. Enjoy special Art Loop Open events all month long and don't forget to vote for your favorite piece of art! Voting runs through October 29, when winners are announced. The art will be on exhibit and for sale from October 30 - November 12. Join Art Loop Open for Station at 6 p.m. Wednesday, Oct. 20. Station is a performance transfiguring the sound scape of the MetraMarket. Station brings local sound artists to manipulate a fixed bank of field recordings collected on-site at Ogilvie Transportation Center, enacting an improvised performance launched during rush hour. Station inaugurates a site-specific exhibition of sculpture and installation exploring themes of transport, transience and industry as part of Art Loop Open. Artists on display - and in competition - include Nick Azzaro, Bill Boyce, Lynn Carlson, Barbara Cooper, Daniel Lavitts, Stefan Eichhorn, Taylor Hokanson and Shin Soo. Stop by anytime from 5:30 - 8 p.m. Thursday, Oct. 21 for the opportunity to meet the creators of the inspired artwork displayed at Chicago French Market! These events are open to the public and there is no charge for admission. For more information, visit http://www.chicagofrenchmarket.com/ or visit their Facebook or Twitter.